This well known species is fond of cold weather, and usually appears in late fall or winter. 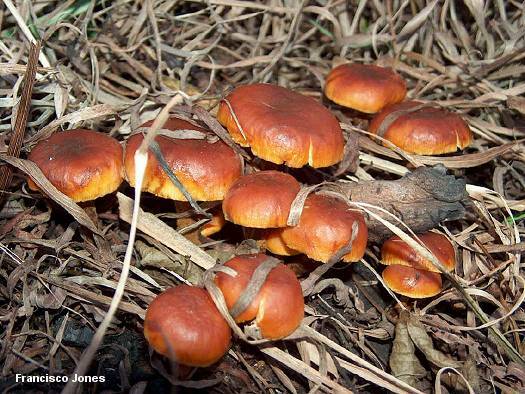 It has a sticky, almost rubbery, orangish to reddish or yellowish brown cap, along with a distinctively velvety stem that darkens from the base upward. It grows from the wood of hardwoods--but the wood is sometimes buried, making the mushrooms appear terrestrial. Flammulina populicola is virtually identical to the naked eye--but is easily separated on the basis of its ecological niche; it grows from the wood of quaking aspen, narrowleaf cottonwood, and other poplars in western North America. 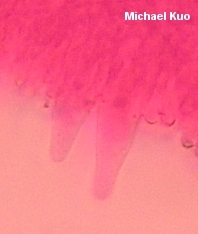 Identification can be confirmed with microscopic analysis, since the two species have differently shaped pileipellis elements and differently sized spores. 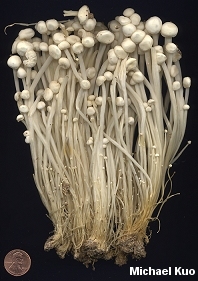 Believe it or not, the "enoki mushroom" often found in grocery stores and restaurants, also called the "enokitake," is a cultivated form of Flammulina velutipes. It looks nothing like the wild mushroom, however; it is pale, long-stemmed, and tiny-capped (see the illustration). 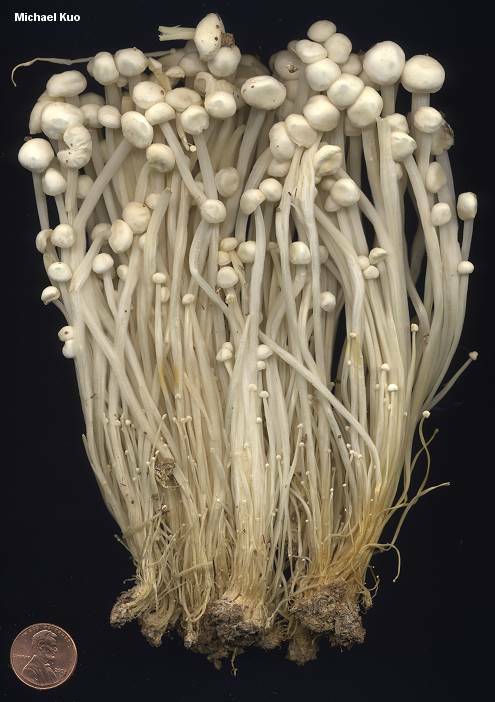 In 1993 cultures of Flammulina velutipes were flown on the Space Shuttle Columbia in order to determine how the mushrooms would handle low gravity. Like many wood-inhabiting mushrooms, Flammulina velutipes typically bends its stem near the base, then grows straight up, resulting in a cap that is more or less parallel to the ground--presumably so that spores will fall easily from the gills. Aboard the space shuttle, however, the mushrooms got confused, growing out of a simulated tree trunk at all angles. In other words, they lost their balance. Whether or not this result might have been predicted by any tenth grader, and whether or not funding for this experiment came from public sources, are questions I will leave to the reader. I will simply point out that, at about the same time, the United States decided to "end welfare as we know it," because it was too expensive. See David Moore et al. (Mycological Research 3: 257-273). 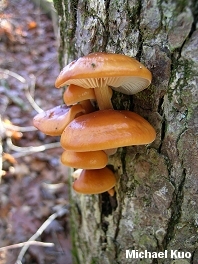 DNA research by Hughes and collaborators (1999) indicates that "Flammulina velutipes is a pan-North Temperate species, extending from Europe east through Asia and from the west coast of North America to the Appalachian Mountains. The well-supported F. velutipes clade confirms that the various varieties and forms of this species are closely related" (978). Further research by Methven and collaborators (2000) isolates three "haplotypes" of the species (Asian, European, and North American; see map below), postulating that "the species may have originated in Asia and may have migrated to North America via the Bering land bridge," and that eastern North American and European haplotypes "may represent the remnants of a Tertiary distribution connected by the North Atlantic land bridge" (1068-1069). Ecology: Saprobic on the stumps, logs, roots, and living wood of hardwoods (but not poplars in western North America; see comments above; growing in clusters; sometimes appearing terrestrial; fall to spring; widely distributed in North America. Cap: 1-7 cm; convex, becoming broadly convex to flat; moist and sticky when fresh; bald; color fairly variable--dark orange brown to yellowish brown, often fading with maturity. 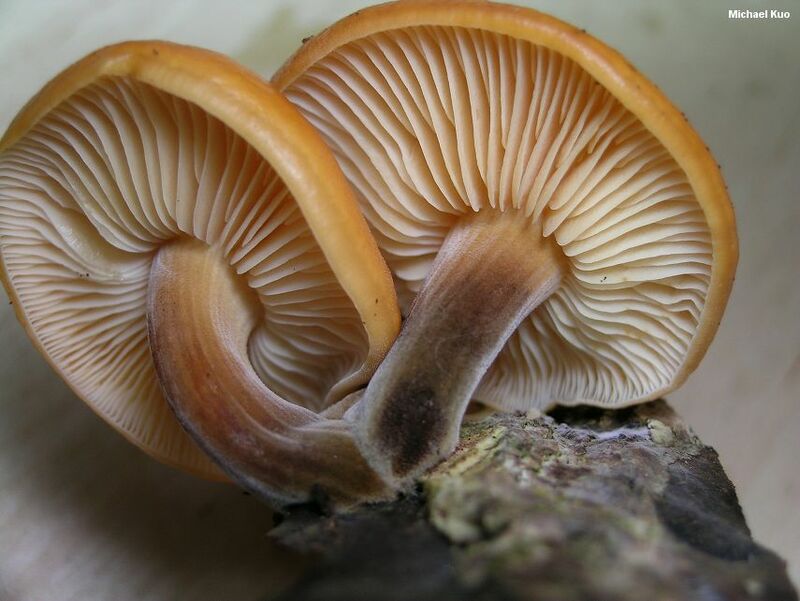 Gills: Broadly or narrowly attached to the stem; whitish to pale yellow; crowded or close. Stem: 2-11 cm long; 3-10 mm thick; equal or larger towards base; tough; pale to yellowish brown or orange brown when young; becoming covered with a dark, rusty brown to blackish velvety coating as it matures. Flesh: Whitish to yellowish; thin. Odor & Taste: Not distinctive. Chemical Reactions: KOH red on cap surface, or sometimes negative on faded caps. 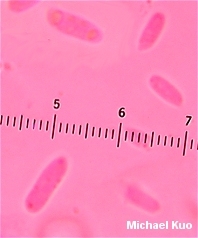 Microscopic Features: Spores 6-9.5 (-11) x 3-5 µ; smooth; more or less elliptical; inamyloid. Pleurocystidia absent. 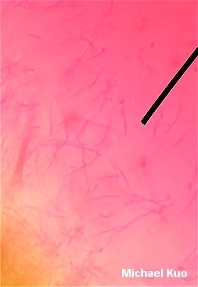 Cheilocystidia scattered or abundant; subclavate to clavate, ventricose, widely fusoid-ventricose, or cylindric; thin-walled; 40-65 x 9-13 µ. Pileipellis an ixolattice to ixotrichoderm above a cutis of branching, clamped, cylindric hyphae that are reddish brown in KOH; terminal elements cylindric; pileocystidia occasional or frequent, ventricose to fusoid-ventricose, brown in KOH, often collapsing. REFERENCES: (Curtis, 1782) Singer, 1951. (Coker & Beardslee, 1921; Lennox, 1979; Smith, Smith & Weber, 1979; Weber & Smith, 1985; Arora, 1986; States, 1990; Phillips, 1991/2005; Lincoff, 1992; Horn, Kay & Abel, 1993; Evenson, 1997; Barron, 1999; Hughes et al., 1999; Redhead & Petersen, 1999; Methven et al., 2000; Petersen, Hughes & Redhead, 2001.) Herb. Kuo 11199401, 04299501, 11210601, 11010903, 11161001.